English whisky may still be a novelty to many drinkers, but they’ve been making it at St George’s Distillery in Norfolk for well over a decade now. Chief distiller David Fitt tells Richard Woodard about spirit style, age versus maturity and making a ‘brewer’s whisky’. ‘So they went for this lighter style. If I had to give a comparison, it’s more like a southern, Lowland style – quite light, fresh and fruity. But then the cut will change that. ‘They only wanted to make a barrel a week to start with. But they built the distillery anyway, so I think it was quite a brave thing to do. I think honestly this distillery was the catalyst for the kind of craft distillers we’ve seen coming through in the years since. I don’t think you would have seen The Lakes, Cotswolds and others. I don’t think they would exist. ‘We are very lucky that there are no shareholders here. Everything that comes in can be ploughed back into the business. I think that’s a really positive thing. 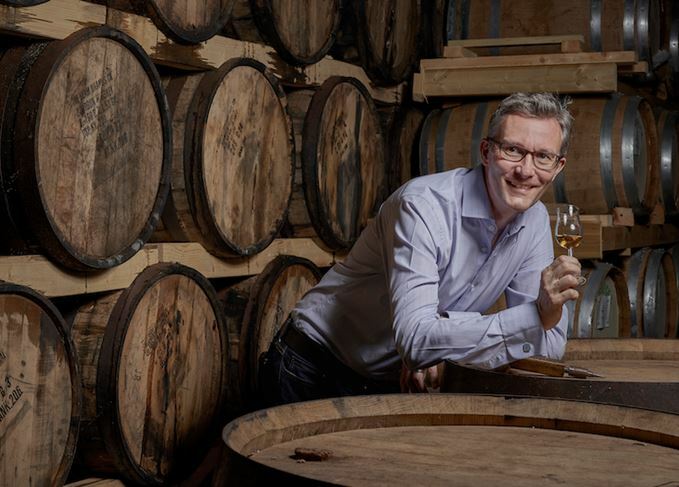 ‘I can remember when we created that little range of [The Norfolk] grain whiskies… When I created that Farmers one, the really wacky one, I said: “I can do it, but it’ll cost more and it might not work.” Andrew Nelstrop said: “It’s my money and I don’t have shareholders.” It enables us to take a risk without having to worry. ‘Although the European whisky rules are slightly looser, we make whisky using the production rules that apply in Scotland. You could be standing in a distillery north of the border. It’s made the same way. ‘We use distillers’ yeast, so the same as in say Bowmore or Auchentoshan. I might look at that, but there’s other areas that I could play around with before yeast. We’re happy with the style it gives us, and so is the consumer. ‘We have a minimum of three days’ fermentation, but we do four days as well, then they’re batched together. It’s fermented out after about 60 hours, but what we’re adding by allowing the wash to be in contact with the yeast is just developing flavour. You also get this slight nuttiness – almost Brazil nut or hazelnut. ‘We do some triple distillation about once a year, maybe eight casks. It works quite well. Our standard distillation is six to six-and-a-half hours, and triple is 12 hours, so double. It’s a whole extra day’s production. ‘Age and maturity are two separate issues. Age is time. Maturity is the interaction between liquid and wood. We have a warmer climate here, and then there’s the nature of wood. You’ve all those other factors coming in. In Scotland, you might lose 2%. Here it’s 4-5%, so there’s more oxidation. ‘As far as we can tell, no-one has ever done peated whisky before in England. Why do it? Iain Henderson was here. Eventually he convinced them to do some, and we’ve kept doing it. We do it in one big lot once a year. ‘What initially happened was the phenol level was quite low, because they were hedging their bets. We then pushed the peating level up, and now we specify a minimum of 50ppm [parts per million]. We can have anything above that. ‘I take quite an early still cut. I could probably make Laphroaig, but why would you? We have this really lovely, fruity spirit. Why dump a load of peat on top? So it’s lovely fruitiness, but with smoke. Because we have a warmer maturation, the peat comes off quite slowly. ‘We take a very high still cut – I don’t go into feints very much at all. The spirit strength is 72% at the safe, rather than 67-8%, but we’re casking at 68%. ‘We’ve got three warehouses, and are building another one at the back. That should give us enough capacity for a while – there’s nothing stored off-site. We buy casks from Jim Beam. We’ve got some Sherry and wine, but Bourbon is the style really. ‘Our oldest whisky is 11 years old, in a Portuguese Cabernet Sauvignon wine cask. With wine casks you go through these peaks and troughs. It will be good, then it will go off, then good again. I used one of them in a tasting recently and it was the most popular whisky there. Personally, I think wine casks are difficult and I’m not a big fan, but that’s my palate. ‘We do refill. We’ve a few third fills on-site, purely because if they’ve been filled twice, it would be for a very short time. As we go forward, we’ll have to review that. Refills here are lovely. We do get a lot of wood on the first fill. Refills are slightly softer and it’s nice to marry those in because you find that complexity. ‘We used to have this chapter idea [with our bottlings], but we’ve scrapped it. It was essentially a sequential numbering system. Every time we had a new whisky, it’d be the next chapter in the series. Fourteen is the last one that we’re selling through. ‘Is English whisky different to Scottish in terms of its identity? I think, because we’re making it in a similar way, generally speaking in terms of flavour, and probably because it’s malt whisky, there’s a similarity. ‘Then again, Clynelish is distinctly different to Macallan, but they’re still Scotch whisky. I hate that Highland, Lowland, Speyside thing, because every distillery has its own character. We should focus on what the distillery can give, rather than looking at the whole area. ‘The Norfolk Parched is my take on single pot still, using malted barley and unmalted barley. Midleton’s about 65% unmalted, so we reversed it with only 34% unmalted. ‘With The Norfolk Farmers, I wrote a recipe, but I took what I’d done in brewing. When you’re making beer, you use different malt to create different colours and flavours – say, crystal malt, or amber malt for a toffee character. Crown Royal takes top spot and Kentucky, Ireland and Japan share the spoils in the 2016 edition.